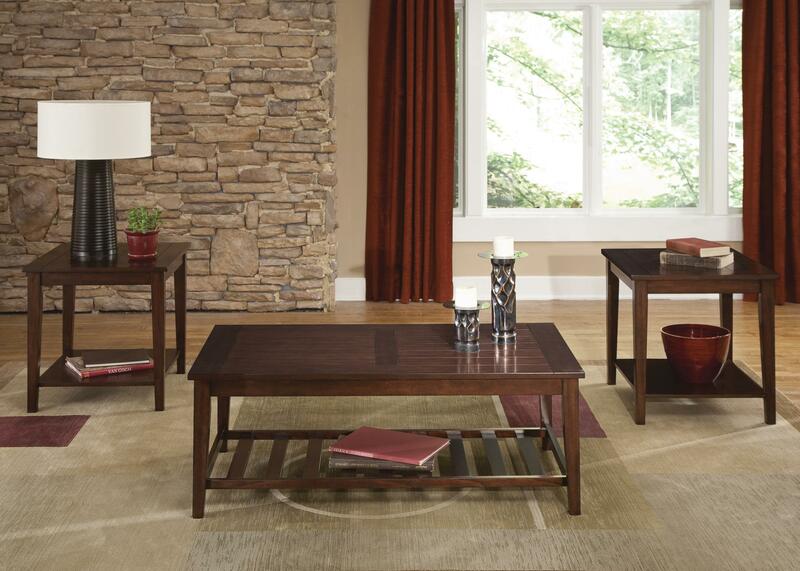 Enjoy bringing a new twist to your living room with this charming table set characterized by timeless architecture. Highlighting the set is a cocktail table, featuring a classic plank style table top with perpendicular slat accents for the open shelf underneath, this cocktail table is the robust piece to include in your living room setting. Able to hold more than just a lamp, the end tables can accessorize in many ways to endure beauty in your living room as it features the same plank style top as the cocktail table. You will make quite an impression by incorporating this cocktail table set as the centerpiece of your living room. The Missoula 3-Piece Plank Style Table Set by Liberty Furniture at Miskelly Furniture in the Jackson, Pearl, Madison, Ridgeland, Flowood Mississippi area. Product availability may vary. Contact us for the most current availability on this product.